Twenty years have passed since the Truman brewery closed here in Brick Lane in 1989 and still much of it stands empty. It hard now the imagine the teeming life of the place that sustained itself over three centuries of brewing on this site. But thanks to the vast British Pathe online archive of news footage, I was permitted a startling glimpse of the lively community that was once here. 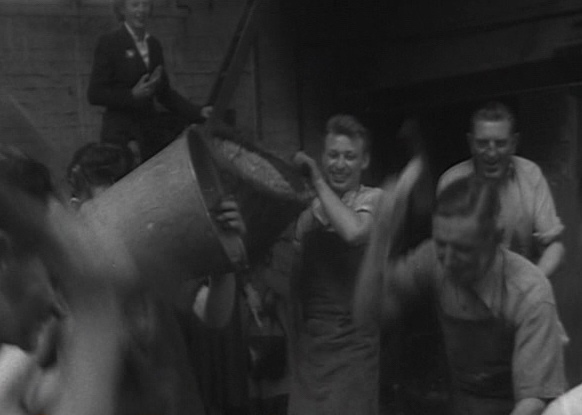 Click to watch this brief riotous film from 1954, Trussing the Cooper, which records a traditional apprentice’s initiation ritual of humiliation. 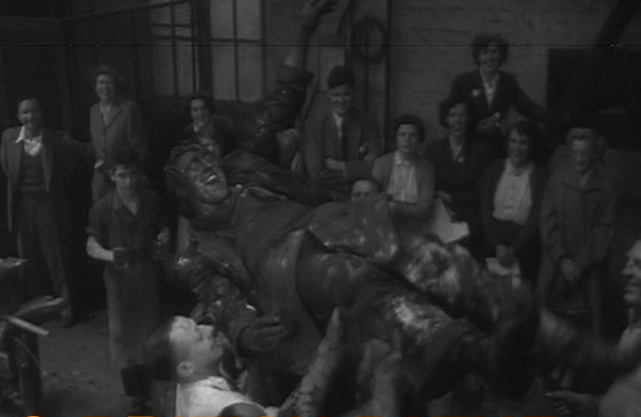 The apprentice, Gordon Wright of Bromley in Kent, is put in a barrel, covered with all kinds of filth and rolled around until he emerges coated in grime to be presented with a pint of ale, now a fully fledged cooper. It is a powerful cinematic cameo with a gleeful Dionysiac energy that cuts across the intervening half century, thrusting us into the joyful heart of their world. Whatever else was going on, these people certainly knew how to make their own fun – but I am glad I was not the one in the barrel. To his eternal credit, Gordon takes it all in great spirit. Maybe he had a couple of pints already to give him some Dutch courage? Great story, and thank you so much for the link to Pathe! I am going to have hours of enjoyment trolling through that archive!! This reminds me of another trade that has vanished from the area and was carried out behind monstrous walls in a workplace where robots were co-workers with six hundred printers. Last year the printing presses at News International’s Wapping plant stopped, “Sun sets on Wapping” was a popular headline, as production moved outside of London. “Fortress Wapping” sits behind a continuous grade 1 listed wall that runs the length of Pennington Street. During the Napoleonic Wars the stores underneath the ‘fortress’ were used as a prison for captured French soldiers and a ghost is said to haunt the current plant. Inside the great printing hall small motorised robots would ferry giant rolls of newsprint to the waiting presses, blindly blinking and beeping their way around the floor like 20th century android dockers.Once on the presses a human hand would smooth out each roll while overhead a network of copper pipes squirted out steam every few seconds to keep the air moist enough to prevent the paper from tearing or creasing. The printers, robots and presses departed in 2008 and now the hall stands empty, but full of atmosphere, inhabited by spirits both human and mechanical.